Inloes Heating and Cooling will keep your home air-conditioning system running perfectly when you need it the most. At Inloes Heating and Cooling we service and repair all makes and models of central air conditioning systems. Our factory trained NATE certified technicians will expertly diagnose, repair and service your air conditioning systems, central air or HVAC to restore optimum efficiency and cooling comfort. All air conditioning systems need annual maintenance. Advanced equipment like today's air conditioning systems benefit in many ways from annual maintenance. An annual AC service will restore the a/c units lost efficiency and make it less likely to suffer a break down. 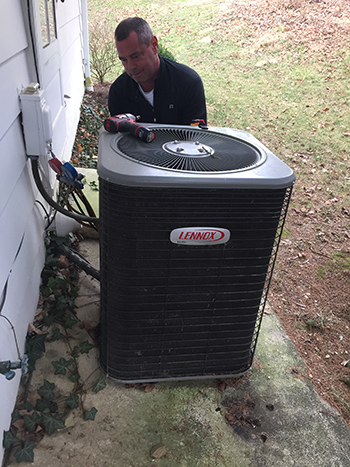 An AC annual service will increase the life span, increase your comfort and allow the air conditioning system to operate more efficiently which saves you money on utility bills. Deciding on the right air conditioning system is an important decision for every home owner. Most often, making the right selection comes down to three factors- budget, comfort and efficiency. To find out which model delivers the best for your home or business, call Inloes Heating and Cooling today for a free estimate and consultation.